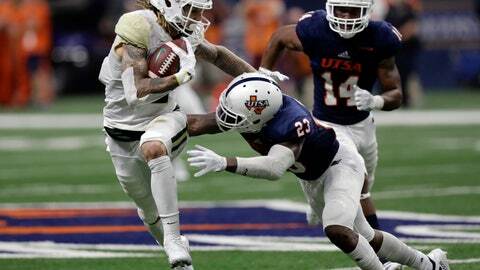 WACO, Texas (AP) — Jalen Hurd made a thoughtful decision to become a receiver for one season at Baylor after being one of the top running backs in the SEC. After going about 21 months without playing a game, Hurd’s transfer from Tennessee and transition to primarily catching the ball instead of carrying it seem to be working out with the Bears. The 6-foot-4, 217-pound Hurd — down about 20 pounds from his days as a bruising between-tackles running back — is fourth in the Big 12 with 6.2 catches per game for Baylor (5-5), which can get bowl eligible with a win in its home finale Saturday against TCU. Of his team-leading 62 catches, 46 have gone for first downs. He has 837 yards receiving (13.5 per catch) and four TDs. When Hurd decided to leave the Volunteers after their eighth game of his junior season in 2016, he was their top ball carrier and only 440 yards away from Travis Henry’s school record of 3,078 career rushing yards. He had eight carries for 16 yards in his final game against South Carolina, and then-Tennessee coach Butch Jones said afterward that an injury kept him out after halftime. When he got to Baylor, Hurd had sit out last season because of the transfer. But even without being able to play in a game, it was busy year making the transition to receiver while also being on the scout team in practice. Coach Matt Rhule said Hurd loves to practice and last year made a real impact on the scout team when often playing the part of the opposing team’s top player. “A lot of people love the games and love the publicity, but he loves to practice,” Rhule said. Baylor initially this season used Hurd only as a receiver — he has at least three catches in every game, and had back-to-back 100-yard games. But since a single carry in the third game, he has had multiple rushing plays in each game — and ran for TDs in three consecutive games . As a sophomore at Tennessee, Hurd started all 13 games and was fourth in the SEC with 99.1 yards rushing per game. He played in 33 games for the Vols, starting 29 of them, and also had 67 catches for 492 yards. The running receiver is now among the national leaders with 47 total plays gaining at least 10 yards this season. Among active FBS players, he is 10th with 4,185 career all-purpose yards and 13th with 33 touchdowns — 26 (20 rushing, six receiving) at Tennessee and seven (four receiver, three rushing) for Baylor. Rhule said Hurd is willing to do whatever it takes to win, whether block, run or catch the ball. The coach described him as an example to young players about how versatility can be an asset.